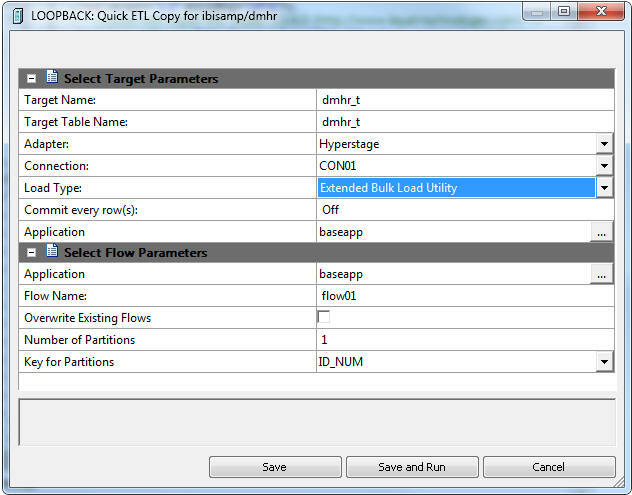 The Quick ETL Copy option generates a simple Data Flow without using the Data Flow designer. For the selected tables, all rows and columns selected are copied to new tables. Although no transformations or where conditions are generated, the Data Flow can be opened as such from the Data Management Console, and additional criteria can be added. Columns identified as key columns in the source are created as key columns in the target. Right-click a synonym name and select Quick ETL Copy. The Quick ETL Copy dialog box opens, as shown in the following image. New. Any existing metadata or data is replaced. Append Existing Data (Keep Metadata). The source data is appended to the target. Replace Existing Data (Keep Metadata). The metadata is kept but the data is replaced. The application directory where the target tables and generated flow will be stored. Use the drop-down menu to select a database configured as an adapter. Use the drop-down menu to select a connection for the selected adapter. The synonym name for the target table. By default, this is the same name as the source table unless the Application directory is the same, in which case _t is added to the name. The name of the target table name in the database. By default, this is the same name as the source table, unless the Adapter and Connection are the same as the source in which case _t is added to the name. Specifies the method DataMigrator uses to load data. Select Insert Records from Memory, Load with Aggregations, Bulk Load Utility via Disk File, or Extended Bulk Load Utility if the database supports any of these options. The number of parallel flows to run simultaneously for parallel processing. This option is only available if the source table has one or more numeric columns as key. The field to use to partition the table. This option is only available if the source table has one or more numeric columns as key. This option is only available when the source is a cluster join for a Star Schema. It is useful when copying to Hyperstage or other column oriented database. Although a single table is created from the joined structure, the synonym retains the structure of the source so that existing procedures that reference the table can continue to be used. The options are All or manual. If manual is selected, an additional dialog box opens which allows you to select which columns are copied. Columns. Includes the Segments/Fields in the target table. Order by. Sorts the target. Filters. Create a filter using the selected field. In addition to copying the actual data, metadata elements from the source synonym are copied to the new synonym for the target. These include Defined fields, Filters, and Variables. When Bulk Load Utility via Disk File or Extended Bulk Load is used, additional parameters are available. For more information, see Load Options. In the Target Application box, select the application directory where to save the flow by either typing in the location of the directory, or clicking the ellipses and manually selecting it from the Select Application dialog box. If Select Columns was set to Manual, select the check boxes of the columns you want to copy. Click Save or Run. Two flows will be created, a process flow with the name you specified, and a data flow with the name followed by the table name. For example, flow01_dmhr. The process flow calls the data flow to copy the table. For faster processing when using Quick ETL Copy for a single table that has one or more numeric keys, the table can be divided into multiple partitions and one job can be run for each partition. You select a column to use, and values are calculated to divide the table by selecting a range of values to partition the source table. When the flow is run, multiple instances are run, one for each partition. Is the number of partitions to create. The default is one partition, and the entire table is processed in a single flow. Is a drop-down menu showing the numeric key columns in the source table. Select the column to be used for partitioning the table. Right-click an application directory and select Quick ETL Copy. Select the tables you want to copy by selecting the check box in the first column. Doing so allows you to change the Target Name, which is the synonym, and the Target Table Name, which is the name of the table in the database. Click Save or Run. Two flows will be created, a process flow with the name you specified, and a data flow with the name followed by the table name. For example, flow01_dmreps. The process flow calls all of the data flows. For Hyperstage, there is an additional Load Type of Extended Bulk Load Utility that supports parallel load sessions. When the Commit every row(s) option has a value other than Off, which is the default, it specifies the number of rows to load in each session. When the number is reached, a new session is started. This feature is most useful for large data volumes, because the recommended minimum value is 1 million. The number of partitions indicates the maximum number of partitions to use. If the Hyperstage Distributed Load Processor is installed and its location specified, when the Hyperstage adapter is configured, an additional option named Use Distribute Load Processor becomes available. This alternate load method reduces the CPU time used.